My steady hands for taking photos began to suffer as I progressed, so please forgive the blurred photos. 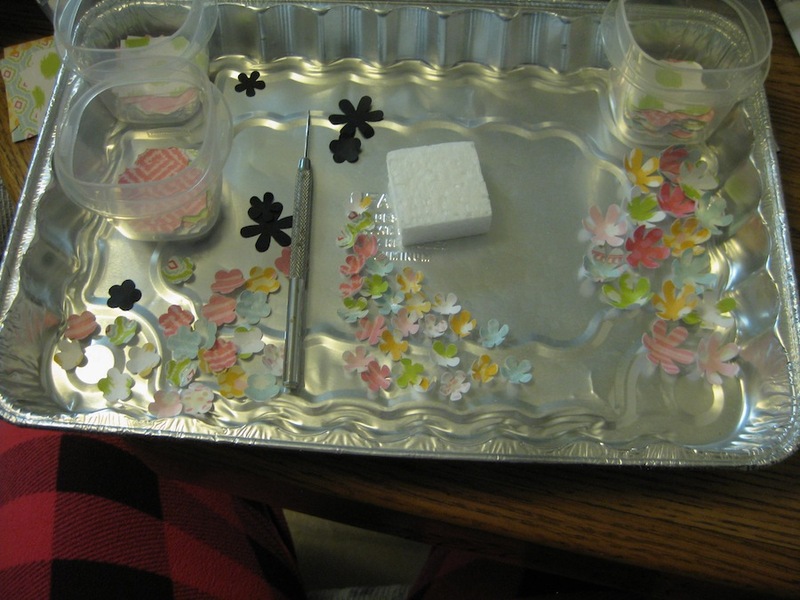 I separated each type of flower in a pan I am using as the “assembly” station for the various punched items. I tried to shape them a bit with the stylus tool on a mouse pad. Meh, they are no longer flat. 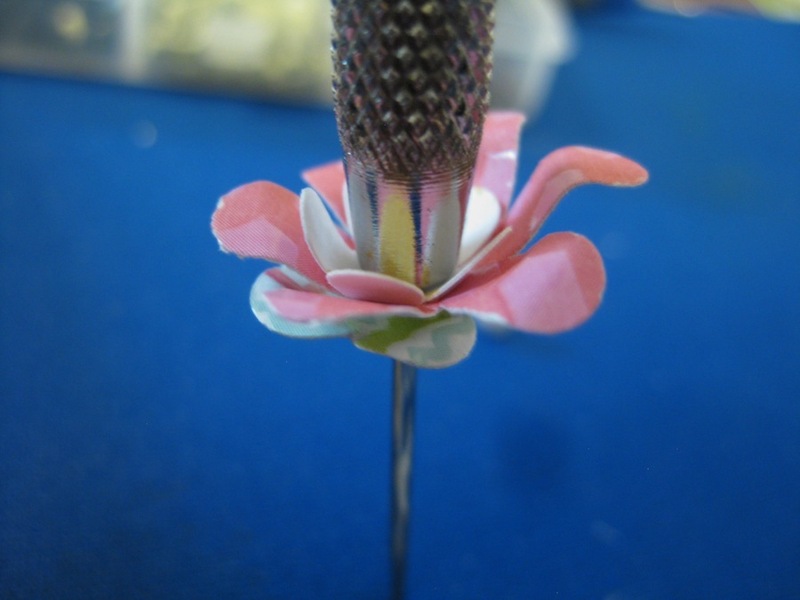 Using a paper piercing tool and a brad to hold the pieces together….I selected three flowers, layered them, then drove the piercing tool through the centers. This makes the hole for a brad to complete the assembly. 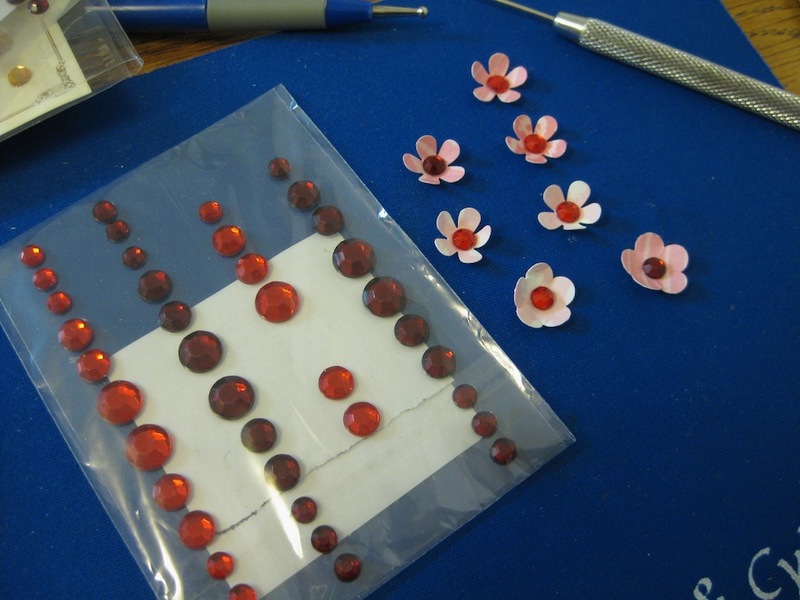 I refer you back to the first photo of the assembled flowers. Fiddly! They look pretty good though. 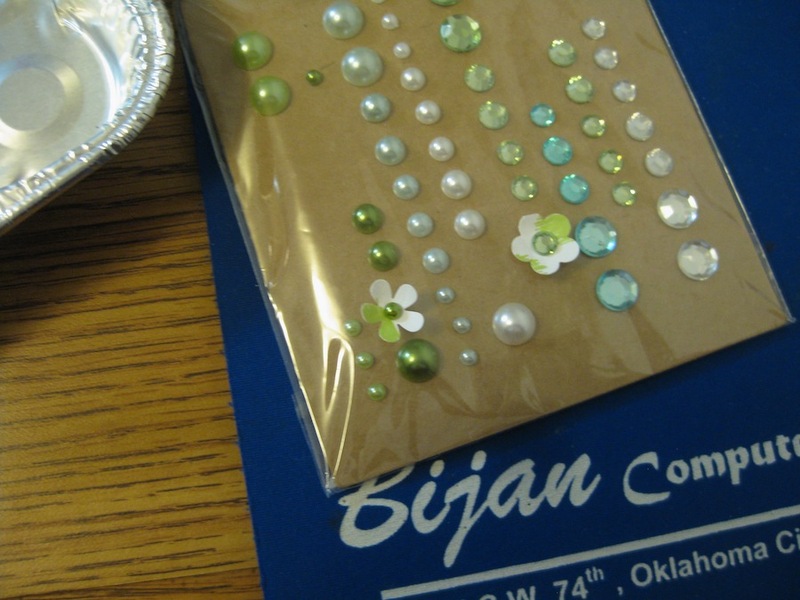 Hey, today I get to use up some of my half back rhinestones and pearls that have been hanging around for a number of years. 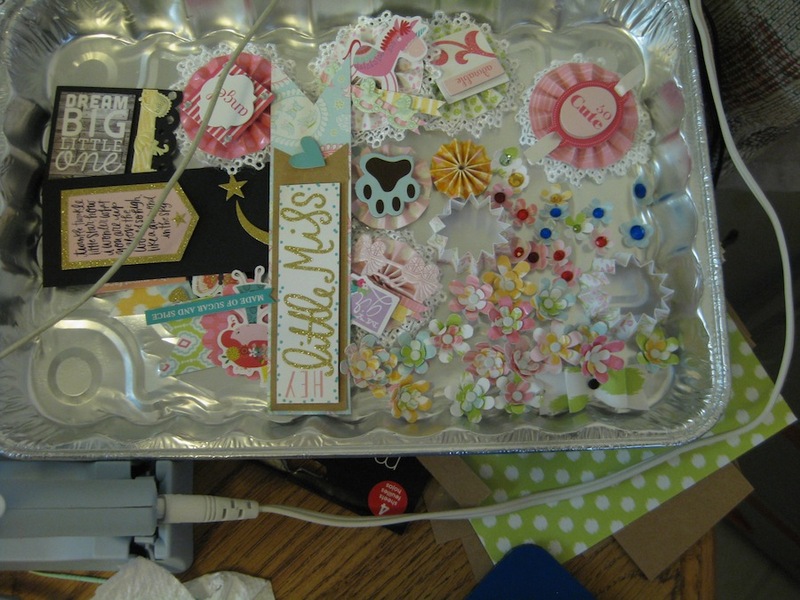 I am getting quite an assortment of coordinating embellishments to go in the Envelope Mini with photos. I don’t know when that will be happening. Well, this is all for today. This is what I fear most. I’ve used lace before. I’ve used beaded ribbons before. I’ve used flowers, too. Doesn’t mean that I no longer fear the silly things. Inadequate. Judged and found wanting. Self recrimination. Self abuse. I suppose, like other things in life, you can develop a tolerance for horrid things after you do it/them multiple times. The tag shown above took me over two hours to make. 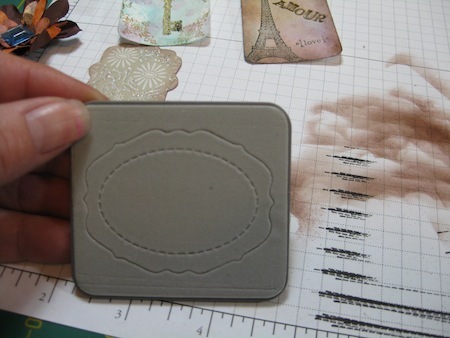 I had the heat embossed swirl applied to the tag in about four minutes as I did the tutorial on heat embossing with stencils. That was the easy part. For me…facing my fears is akin to finding a spider coming from above on its invisible web. No matter the size, minute or as big as a quarter, that spider will send me running and squealing. Calling out for help to my “Spider Slayer” husband. When he is not home to do this job then I am left to deal with the spider myself. Most of the time it gets safely away to torment me another day. A small pile of lace trim sitting on my work table can make my stomach twist, my heart beat faster, dread well up from the depths of my core. 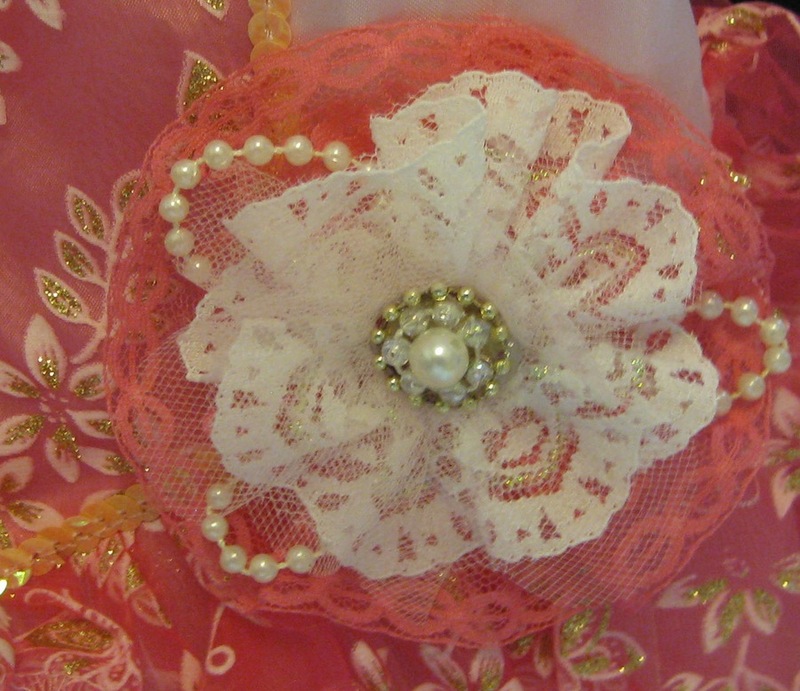 My eyes flick back and forth from the lace trim to the blank tag. My brain has shut down at this stage and all I feel is the fear. I find that I have been holding my breath. You’d think that I was in imminent danger of my very life. 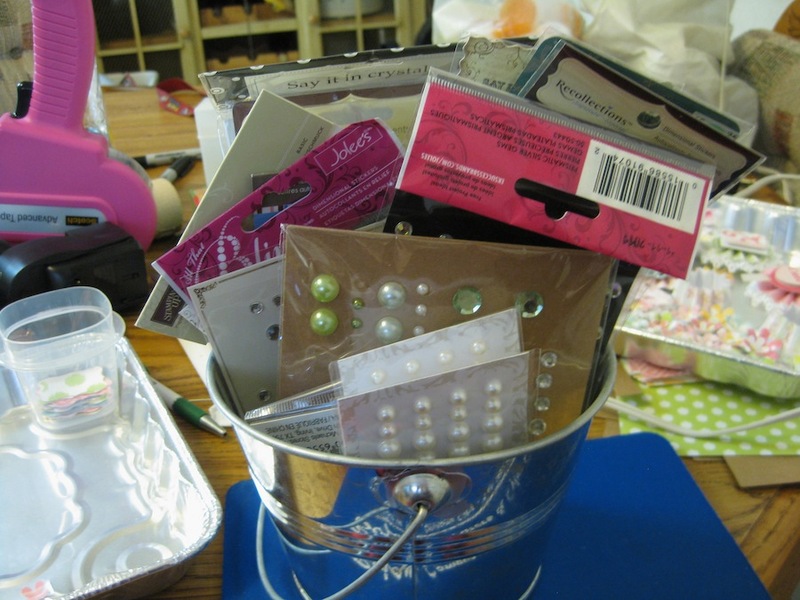 While I’m creating cards or other abominations in my craft room, I start with a glimmer of an idea. As I begin the process of gathering my supplies that glimmer turns into a spark, then into a fully fledged idea that I will work toward. 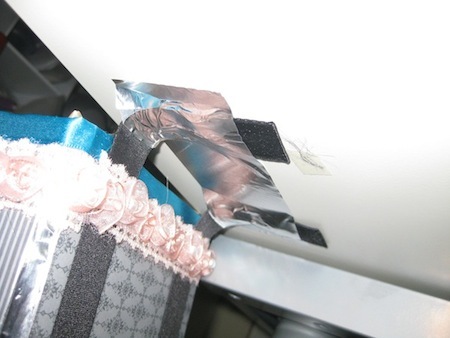 Not so when faced with lace trims. I used my video camera to document my progress from paralyzing fear to actually completing the tag. As I said, it took well over two hours to make this one tag. I’ve edited the video down to about 18 minutes. So anyone out there that is scared out of their minds, terrified to make the first move, and have clamoring voices in your head telling you to STOP…..Take a deep breath and STEP INTO YOUR FEAR. You’ll never know how it will turn out. Your first attempt may look like something that needs to be immediately thrown in the trash bin. That is not the message. The message is YOU DID IT AND YOU SURVIVED IT! You learned a little something along the way. Your next attempt will be better. Maybe you will have found a nugget of information to use on your next project, whatever that may be, as you watch my video. I’m working daily on trying to become friends with flowers. I love, love, love to look at real flowers and wonder at their beauty. I just have a problem making them myself or using them on projects. The problem is simply – FEAR. Fear of not putting them in the right place. Not using the right color. Not combining sizes right. Mostly it is just a fear of being judged and found wanting. This year I am attempting to get over myself and “Just Do It”. Fear holds me back from so many things. Over the years I have conquered some of my fears and lived another day 😀 So now I’m working on this one. So far…..I’m still alive. I’m surviving the ordeal, and I’m pretty pleased with the results. 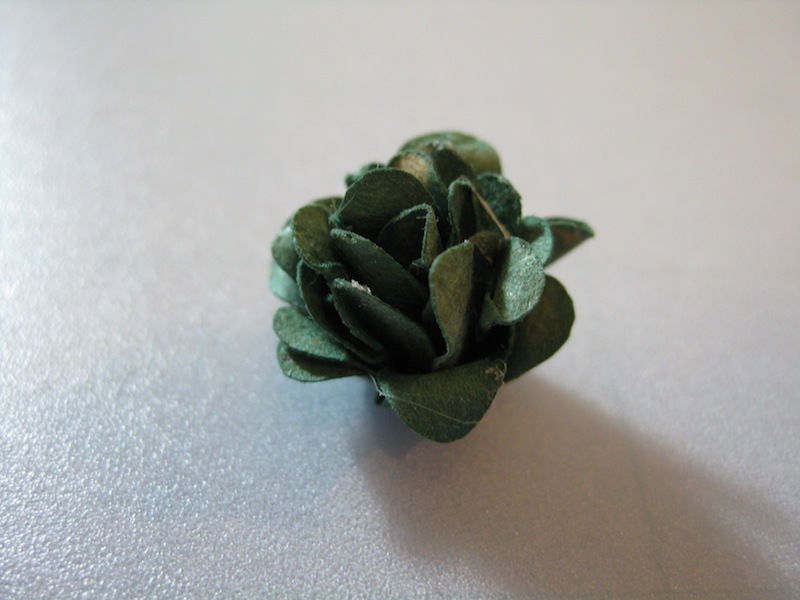 Kathy, from Paper Phenomenon, has a video on making little roses. You can watch this video and hopefully become inspired as well. 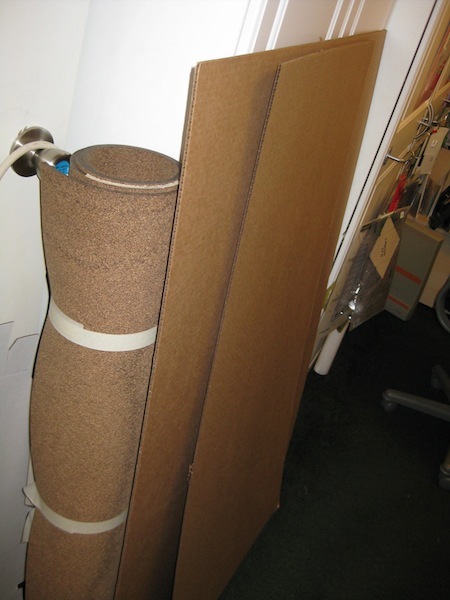 I have a huge roll of craft paper. Don’t know when we got it, where we got it, or even why we got it. I just have it. It resides in a corner of my foyer. If you want a giant roll of paper you can find this at your local home improvement store. 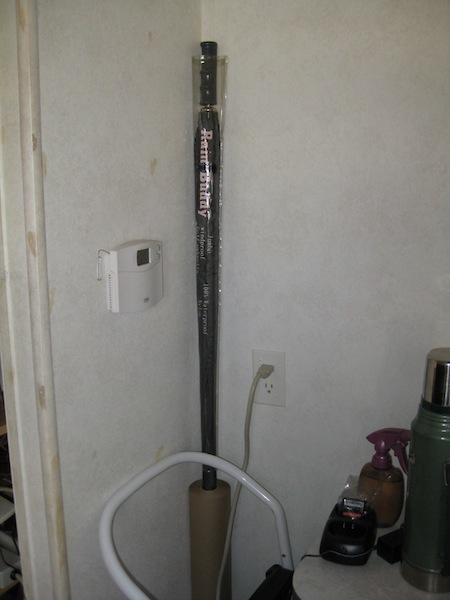 I think it is used to protect floors from paint and other construction/remodel stuff. 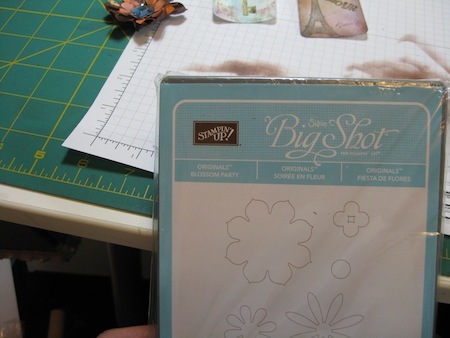 This paper is NOT ACID FREE and I don’t recommend using it in scrapbook layouts. 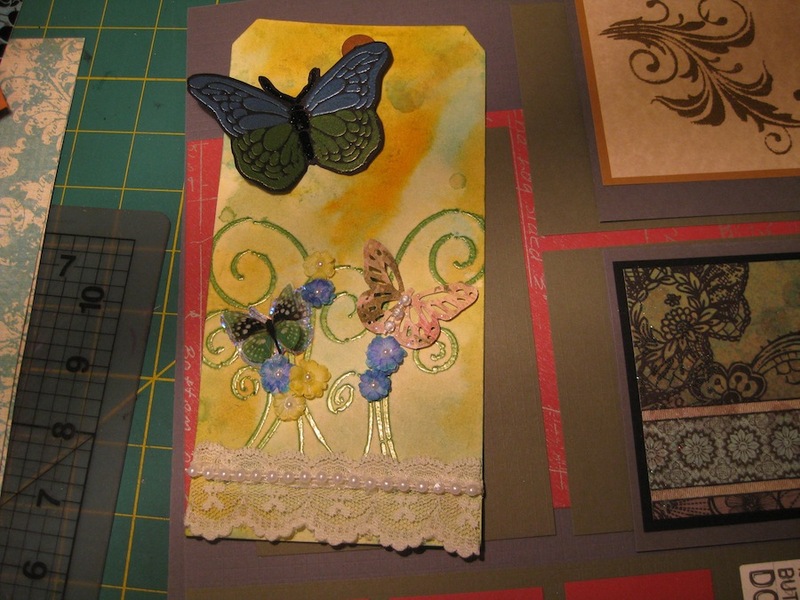 You can use the products you make from this paper on cards or anything else that will not be placed in scrapbooks. I had to make a box for the clock going to our friend at Dependable. 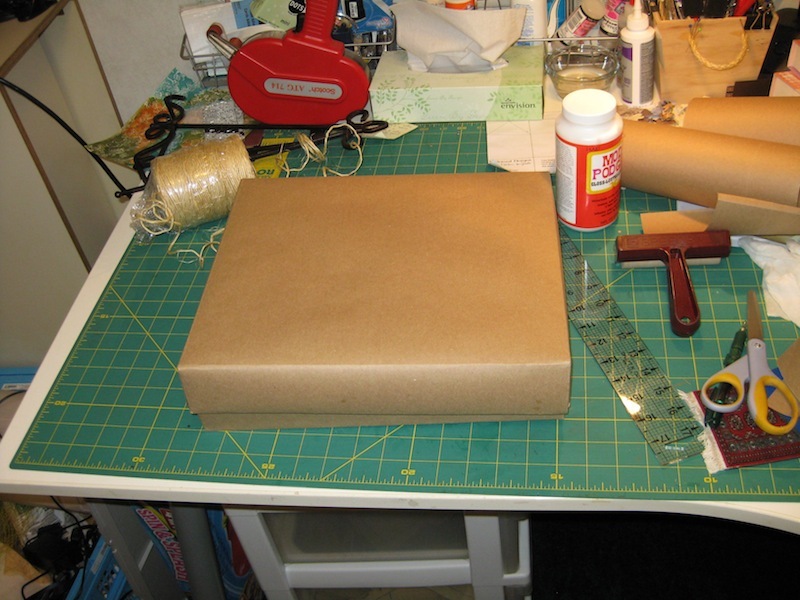 I don’t have card stock in a large enough size to cover a box that measures 12″ x 11″ with 2″ sides. So I figured I’d use this craft paper. 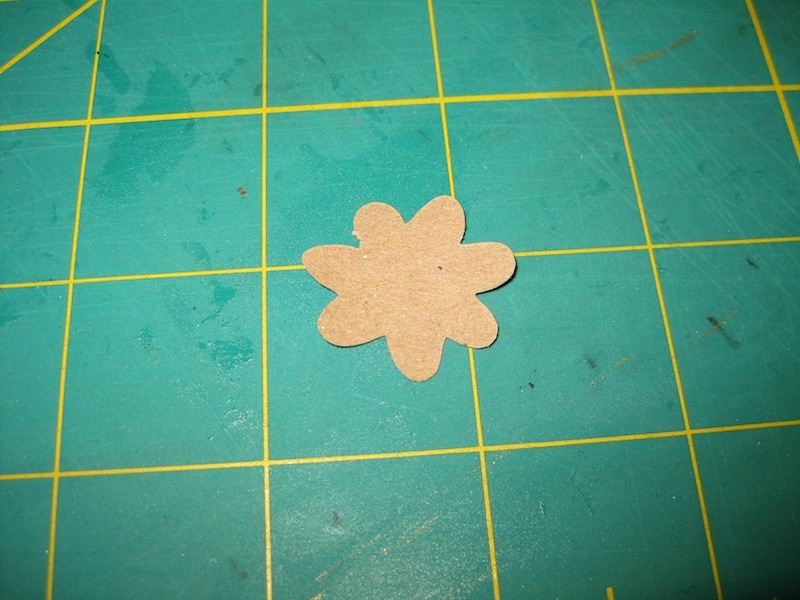 I cut up a piece of the cardboard sheet I have for my Post-It-Note Holders. Let me tell you, making the box for the clock was a trial in Math and construction. The roll next to the cardboard is cork. That will be used on bulletin boards I am going to be making later. Nice thick stuff. The stick pin won’t be going through the back of the frame I will be using. Here is the box and lid I made for the clock. 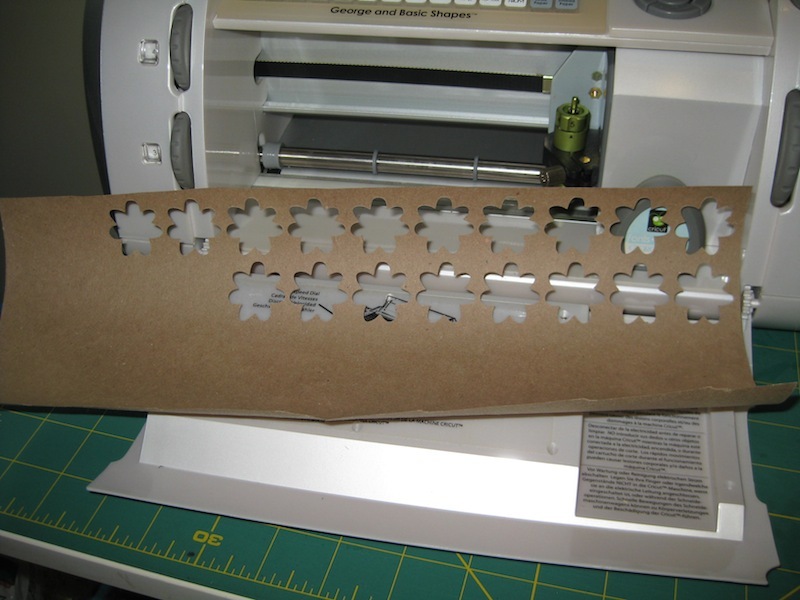 The paper strips inside the box on either side of the clock are to make it easier to get the clock out. Man did I make it a tight fit 😦 That thing isn’t going to be moving around inside the box. 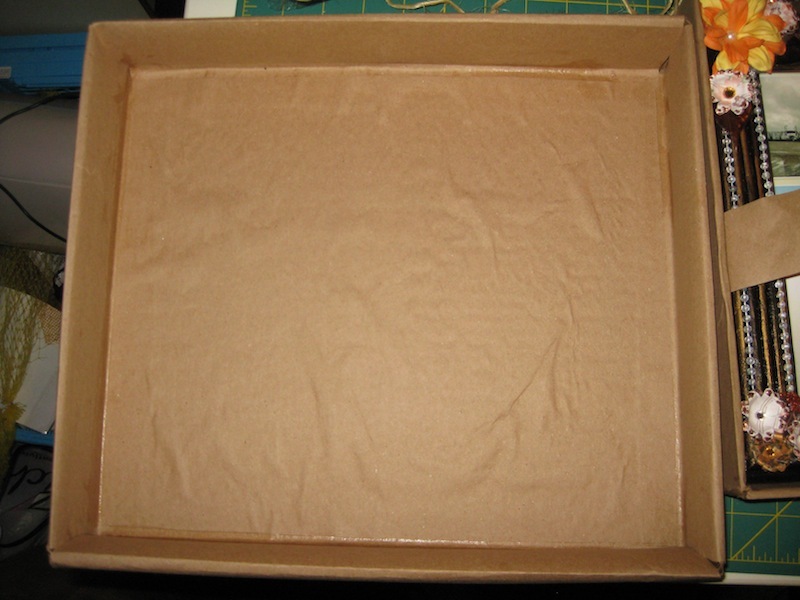 This craft paper is extremely hard to get smoothed flat after it comes in contact with moisture. I’m not over the moon about this box and the way that it looks but it will do. 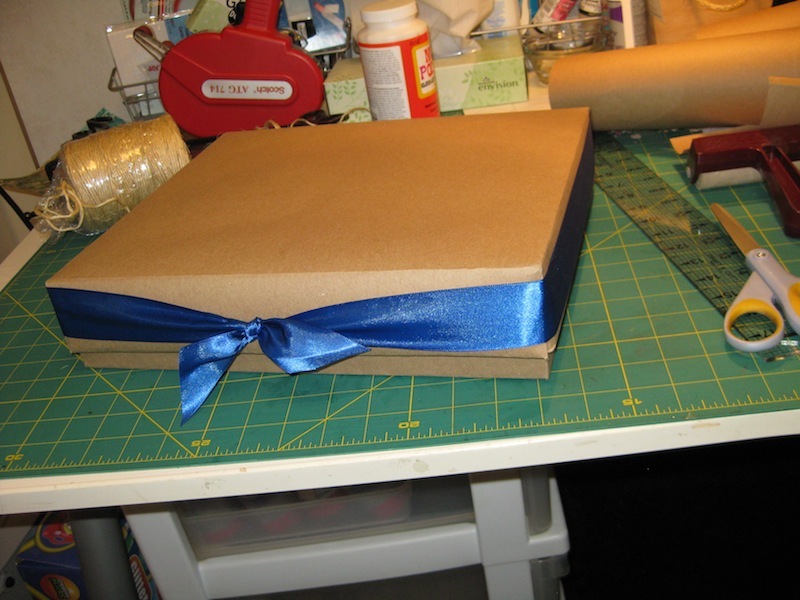 I’ll have to find some other kind of paper to use the next time I build another one of these boxes. This is the first cardboard box I’ve ever constructed. Covering it with the craft paper left open edges that I needed to hide. 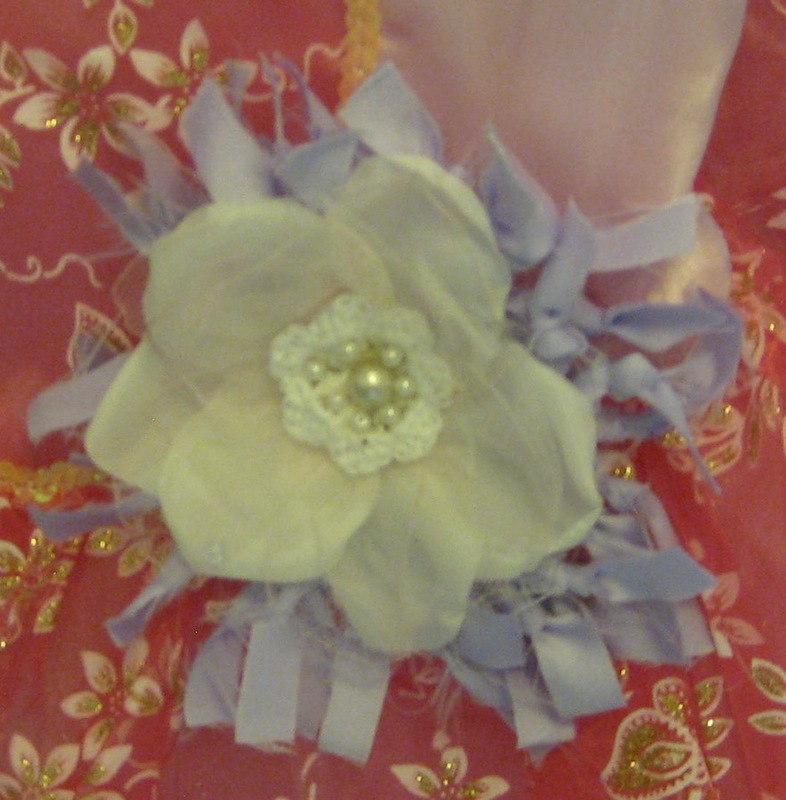 So I used a wide piece of satin like ribbon I’ve had for a long time. 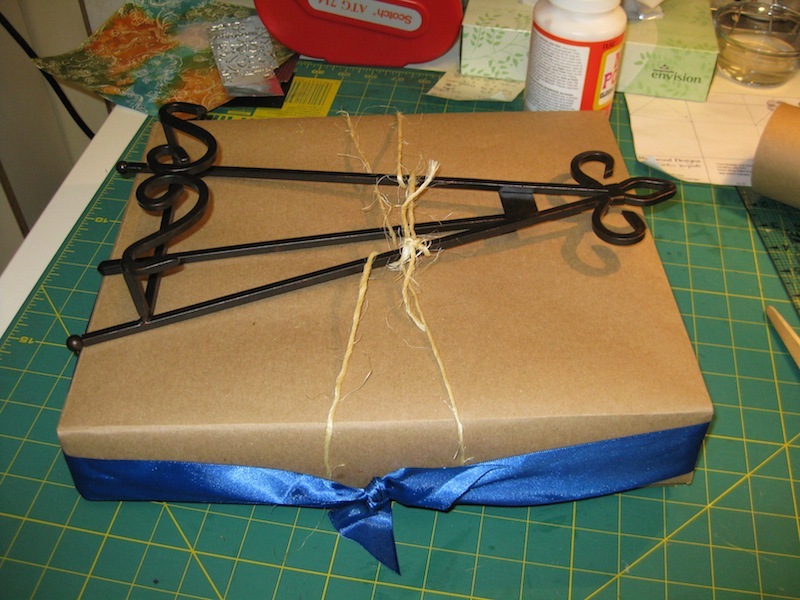 I tied the stand on the outside of the box with some jute twine. Not very pretty but it will do. 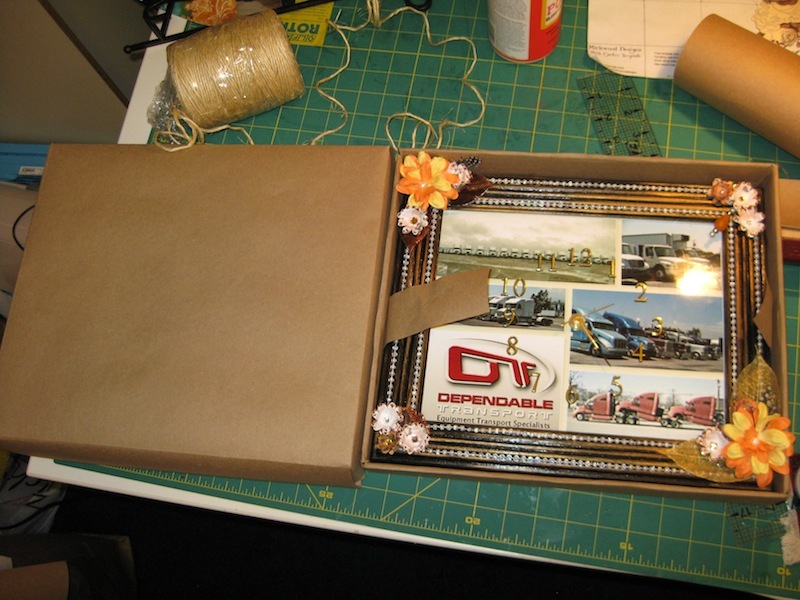 At least Joe won’t have to keep putting his hand on the box while he drives to Akron, Ohio to deliver his trucks with a stop over in Joplin, Missouri to deliver this clock. Okay, now for the flowers. 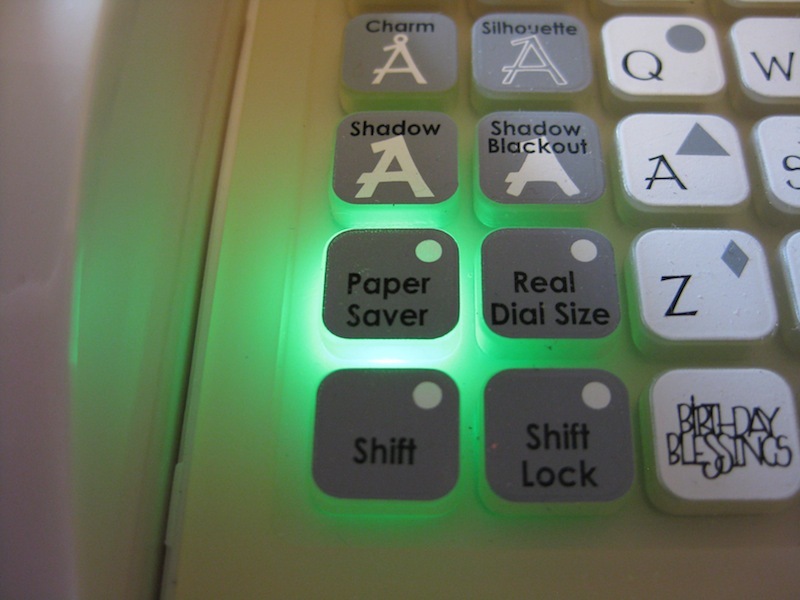 I have a “Baby Cricut”. I bought this one in Wichita, Kansas just after this machine hit the market. It has been a long time….since around 2006. 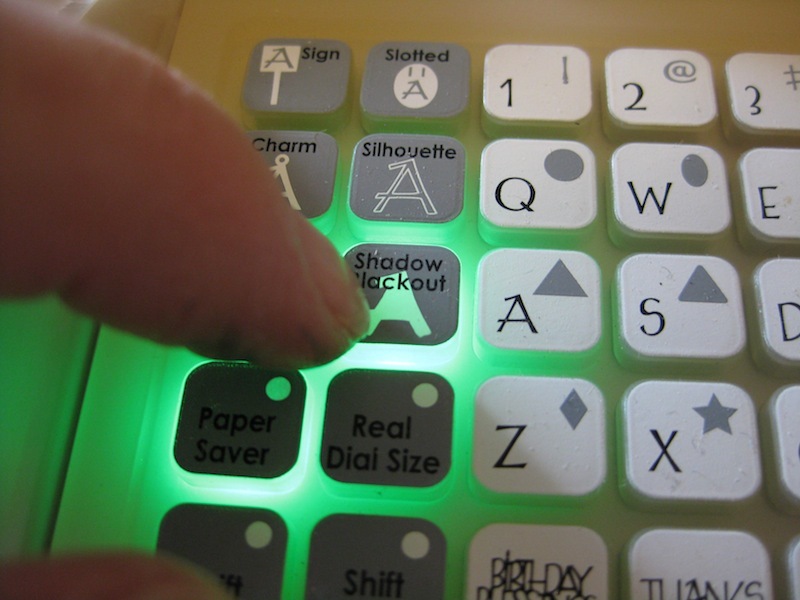 If you have a Cricut Expression or one of the newer models I think what I’m about to show you is pretty much the same. The Expression has buttons on the side for other things and I can’t help you with any questions about that machine since I don’t have one. 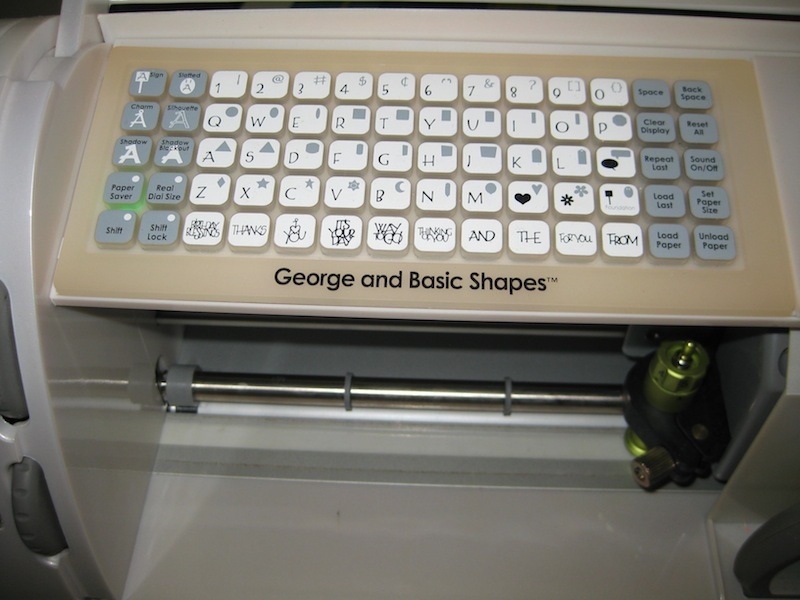 The cartridge I have been using is the “George and Basic Shapes”. I have the “Paper Saver” button on. This will not leave a lot of space between cuts. I have the “Shadow Black Out” button on. This feature cuts the outside shape of the item with no other details. I have used the flower feature that is in black. Using the Shadow Black Out feature the hole in the center of the flower will not be cut. 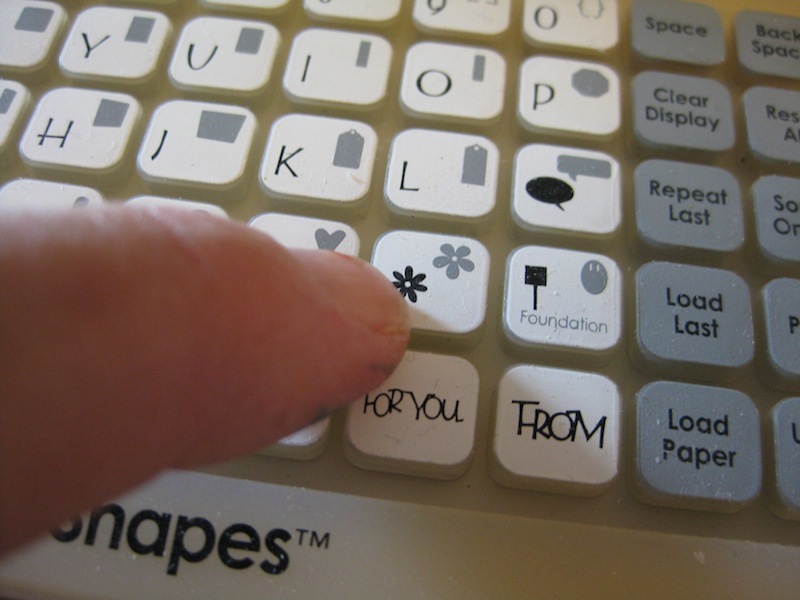 I pressed the black flower button six (6) times to get that many shapes cut. 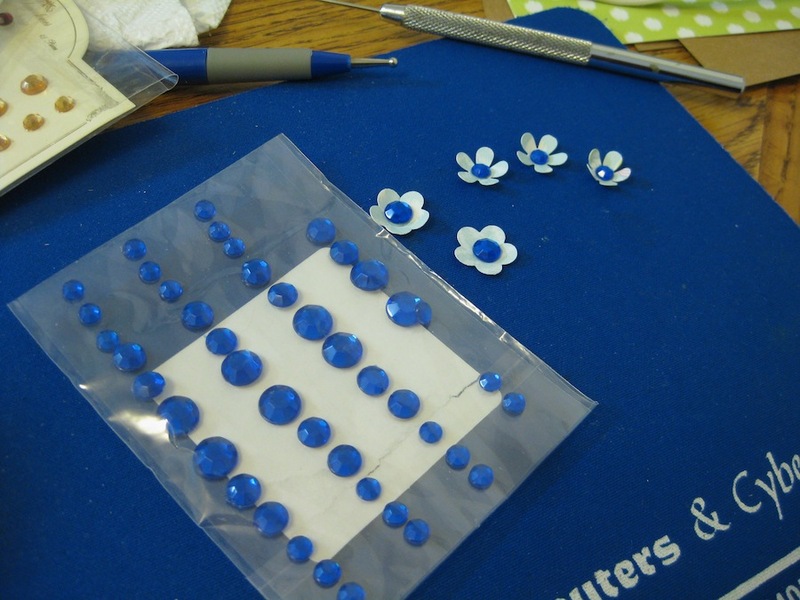 I stuck a piece of the craft paper to the sticky sheet thing and cut several of the flowers out. I forgot to tell you. 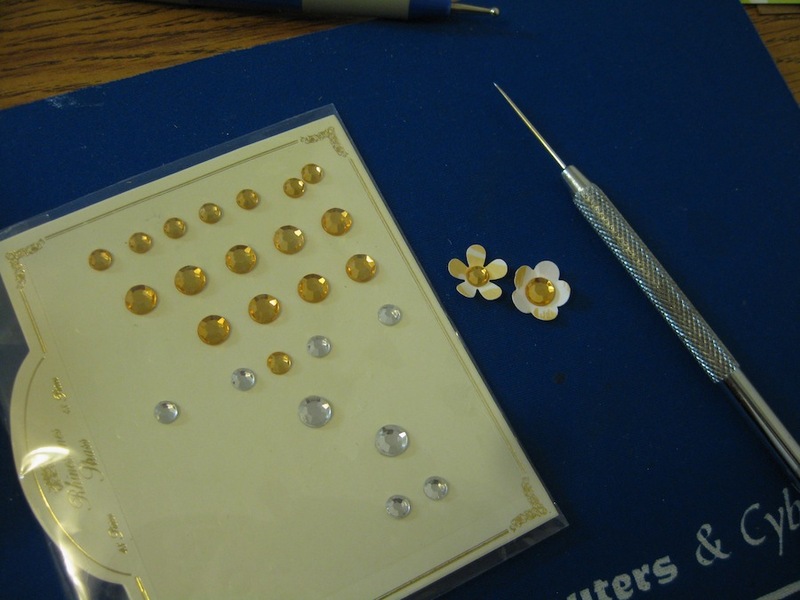 I cut the flowers out at the size of one inch (1″). This craft paper is pretty coarse. 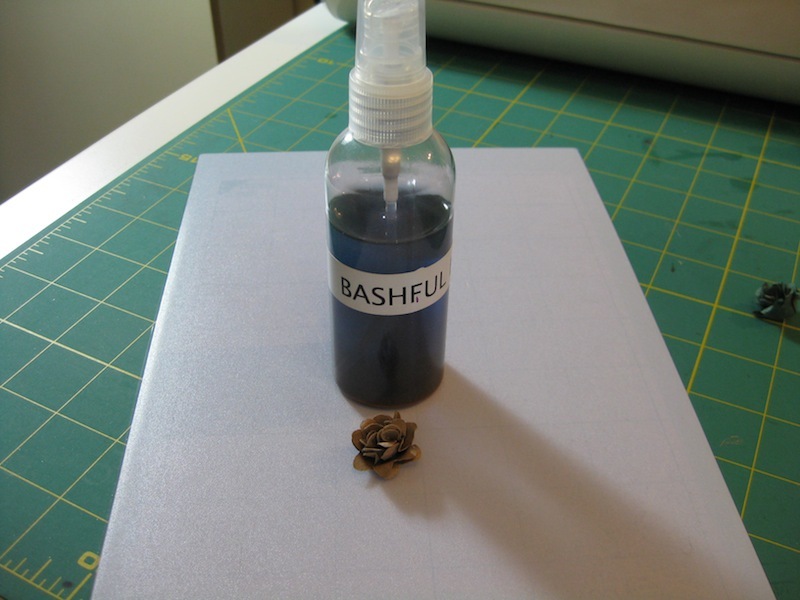 The first thing I tried for was SPARKLE using one of my concocted spritz. 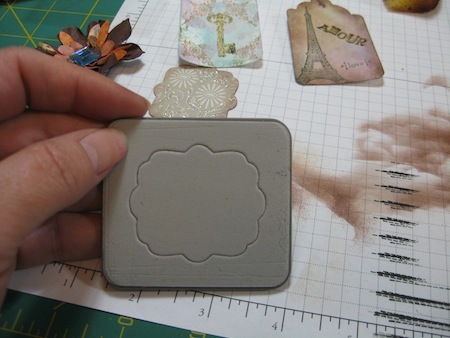 This one is Bashful Blue from Stampin’ Up!. The color and sparkle didn’t show on that one so I decided to use some acrylic daubers from Ranger. The first one is Red Pepper and I only daubed it on one side of the paper. 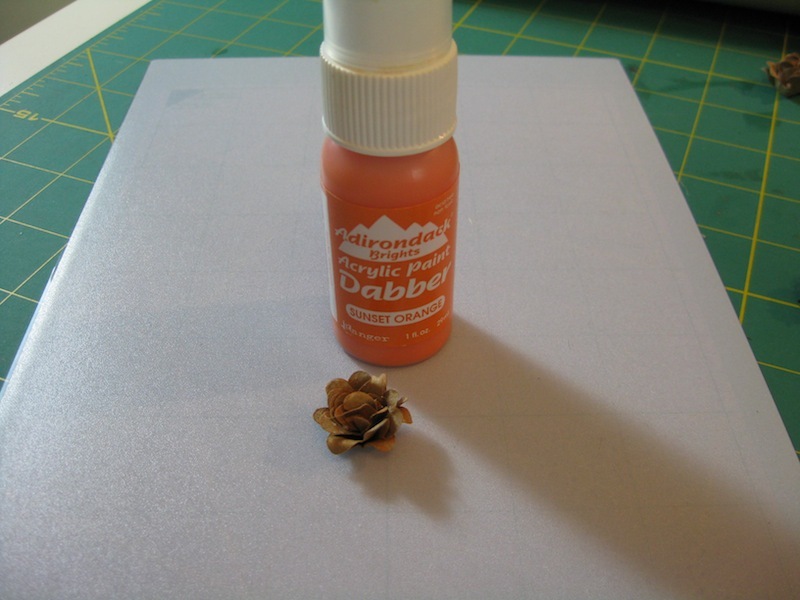 Next I tried Sunset Orange acrylic dauber and put the paint on both sides of the paper. 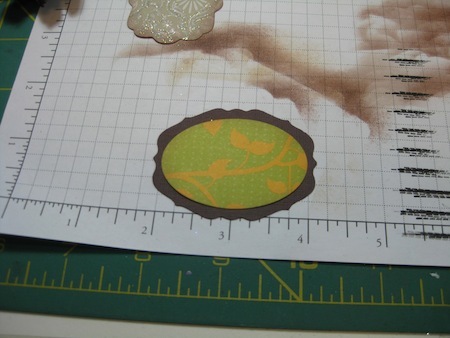 The brown craft paper needs a heavier hand with the acrylic paint to overpower that brown. 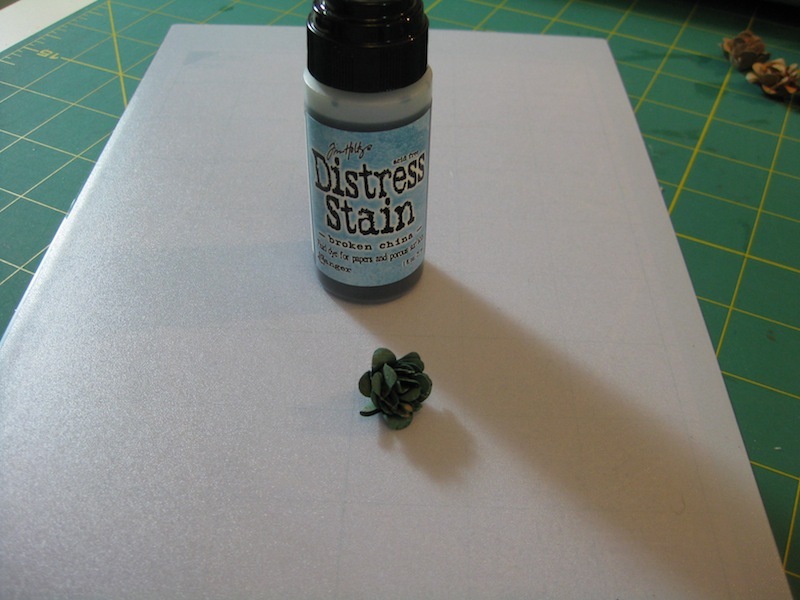 So the next one I tried was with Broken China Distress Stain. And here are the four roses I’ve made this morning. Kathy, from Paper Phenomenon, says these are quick to make and she is right. It doesn’t take long to make these. 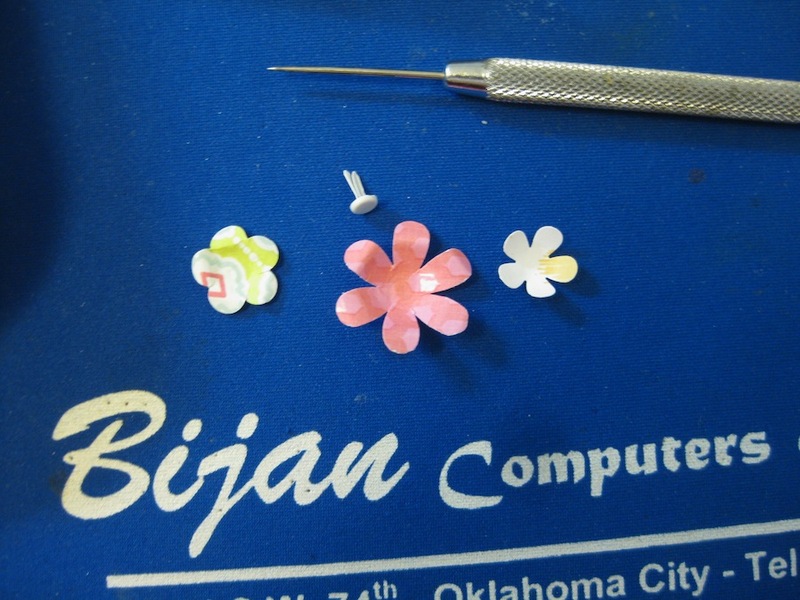 For a “beginner” it took me about an hour to make these four flowers. 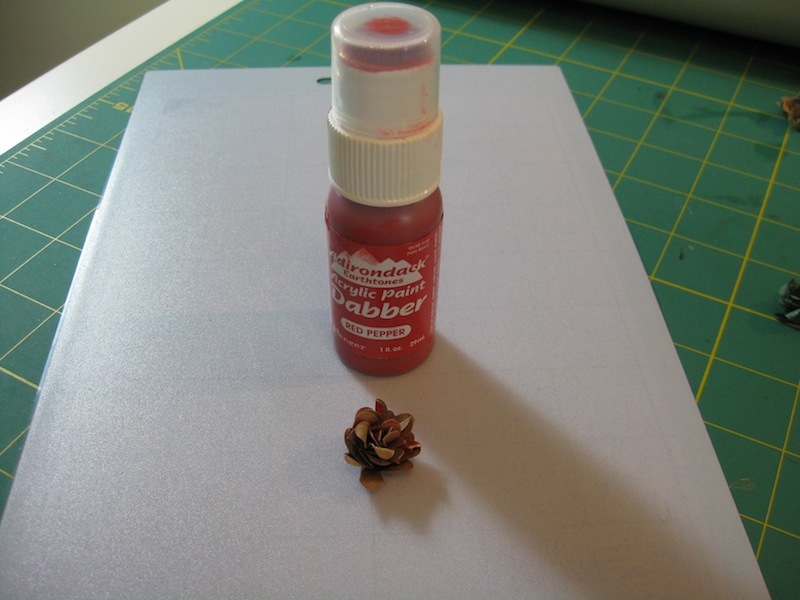 It would have been less time involved had I used just one color thing – spritz, acrylic dauber, or stain – instead of trying to figure out what would work best. As you can see from the results. This is a good way to make the roses. 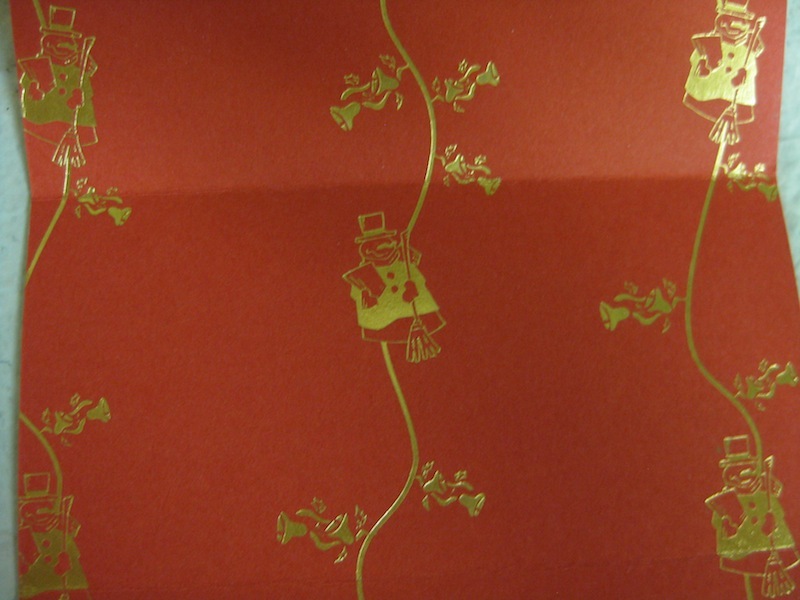 The craft paper still is very evident and the color does not take well to this paper. I kind of like the way they have turned out. 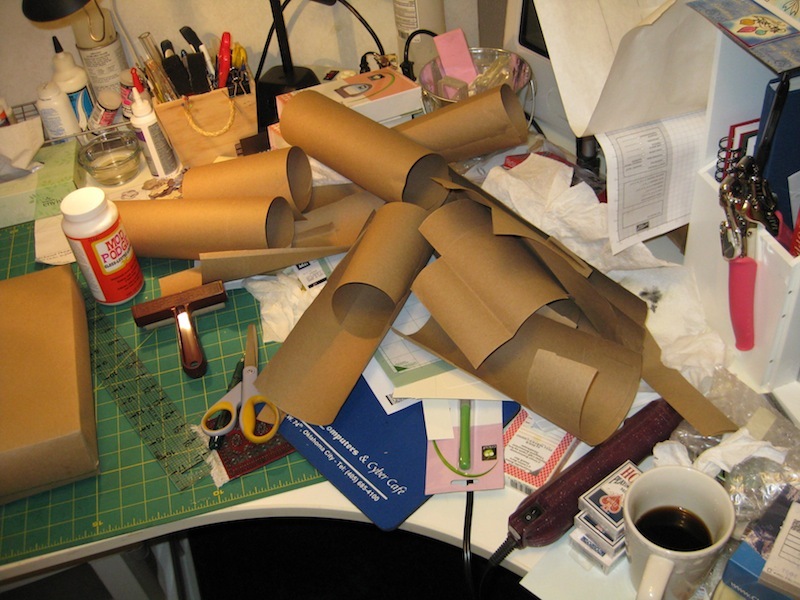 Okay, now I have to get back in my craft room and get cracking on the seven Post-It-Note Holders I have been requested to make. I am attempting to conquer my fear of flowers. 2012 I am determined to make these things my FRIEND instead of my FOE. Are you up for a challenge? 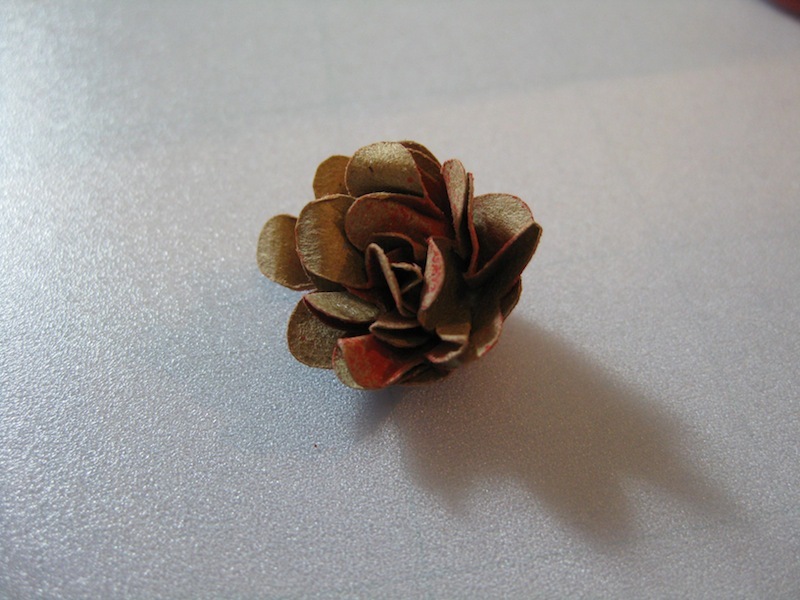 Go to your craft space and find your Prima flowers, or other loose flowers. I’ve found a photo tutorial on working with these flowers. 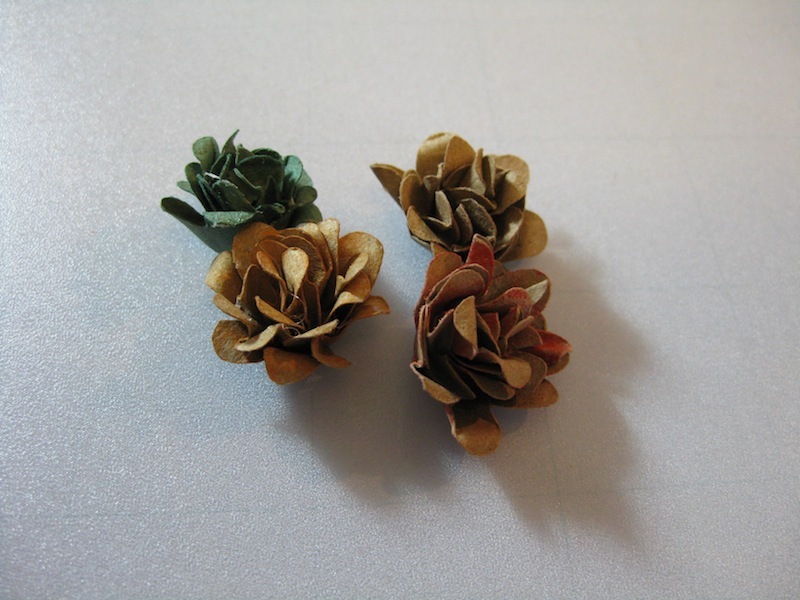 In my Google search for using paper flowers I stumbled upon this blog. 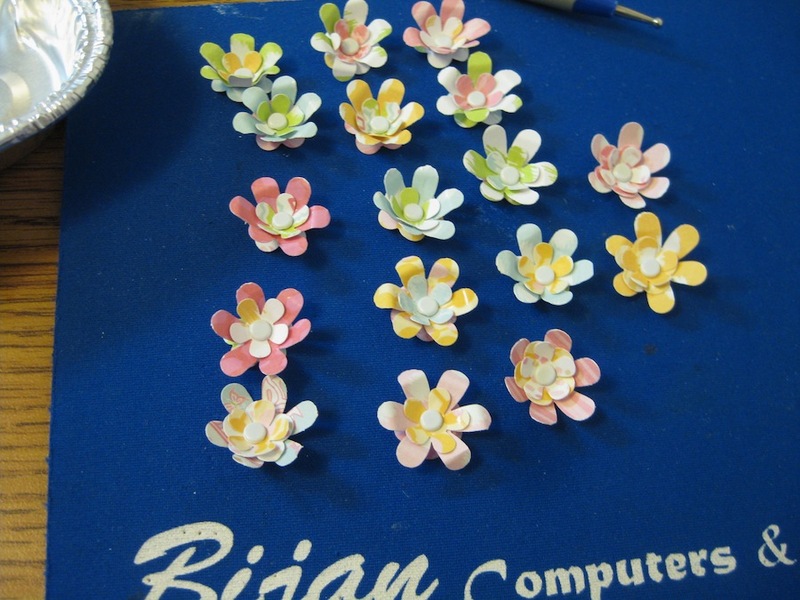 Following her directions on these larger loose paper flowers I was able to create these. The yellow and orange flower with the pearl center. 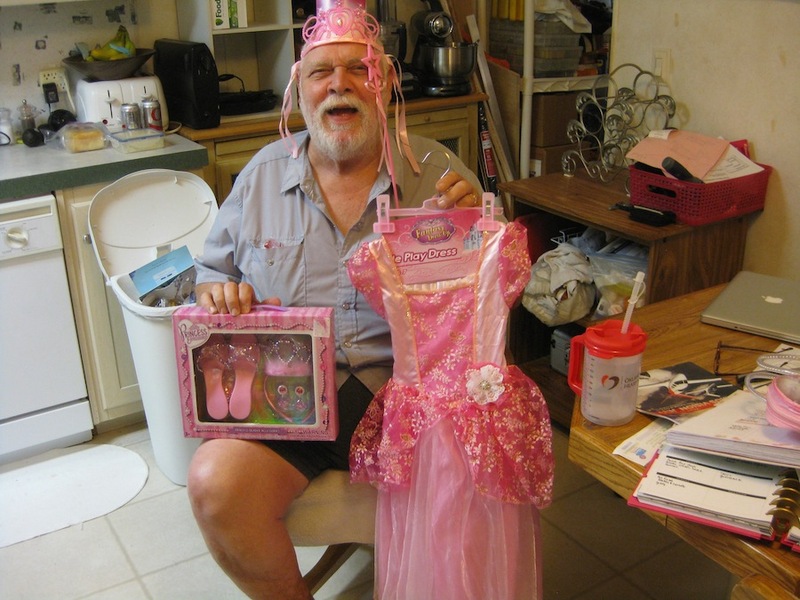 Lynn – I finally received your Christmas card. Thank you for the delightful card you made. 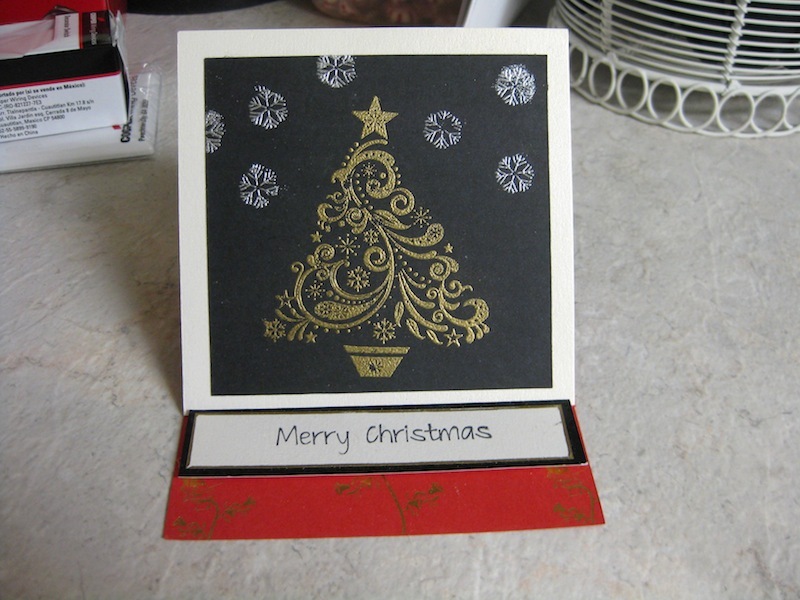 Cool easel card you have made. Someday I think I may have to try making one of these. 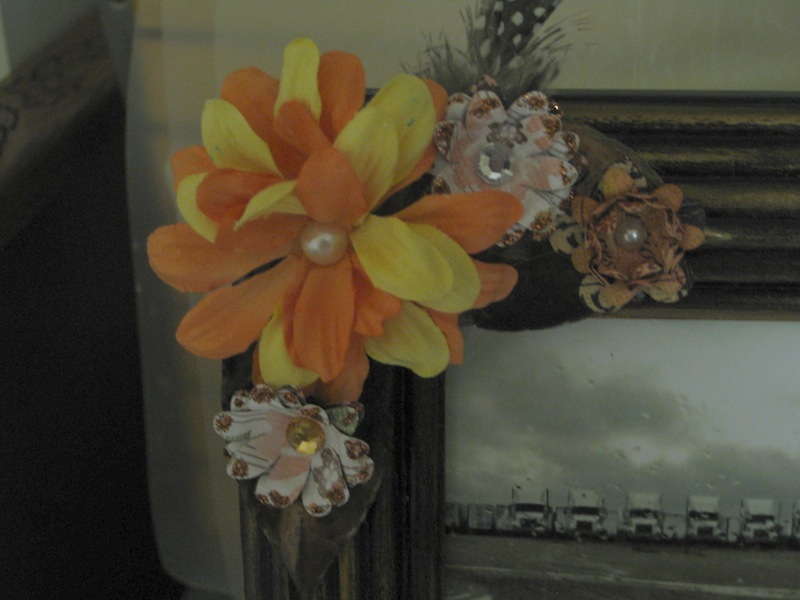 If there is anyone out there that has a favorite tutorial on making flowers let me know where to find it. This flower challenge is open to anyone that wants to give it a try. Time is ticking away. There are only three days left in this month. Can you believe it? That also means there are only three days left to the Sale-A-Bration opportunity. Yesterday, I had one of those days that was not conducive in getting things done. My mind would not stay on any one thing for very long and everything I did to poor Reilee’s wooden box had to be taken off again. My fingers weren’t working right and my heart was just not in it. The time for my leaving for back out on the road is fast approaching and there is a lot of things yet to do. When I have days like this, depression niggling at the corners of my brain, I do some “rogue experimenting”. Kind of like guerrilla warfare on my thoughts and feelings. Days like this I have to attack the “Whining” and annihilate it. 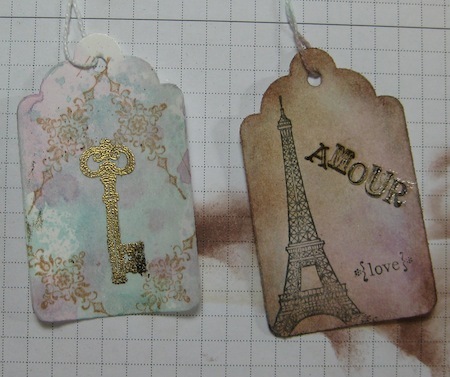 Who doesn’t love the look of Tim Holtz tags? Since I have a box full of these merchandise tags I figured it was time to get that box out and see what I could come up with. 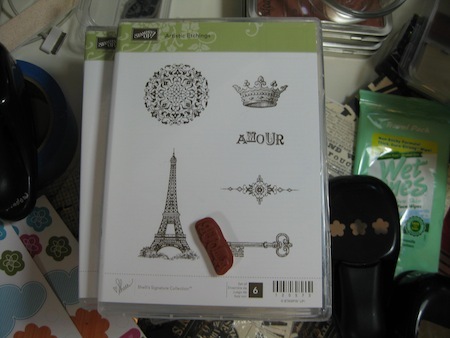 A “love” stamp from the Tiny Tags stamp set was used on the right hand tag. The other two images are from the Artistic Etchings set. 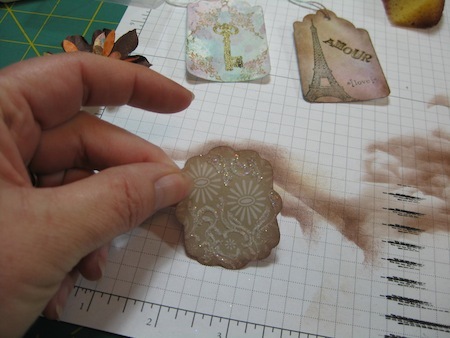 The left tag is using the key and flourish like stamp from the Artistic Etchings set. I’ve used Basic Black for the right tag and Creamy Caramel on the left tag. The key has been embossed with non SU gold powder. The backgrounds of both of these tags were sprayed or blobbed on with my “brew” of SU ink refill sprays. I’ve had this set of four (4) Sizzlits from SU for quite a while. This is the number 1 label die in the set. 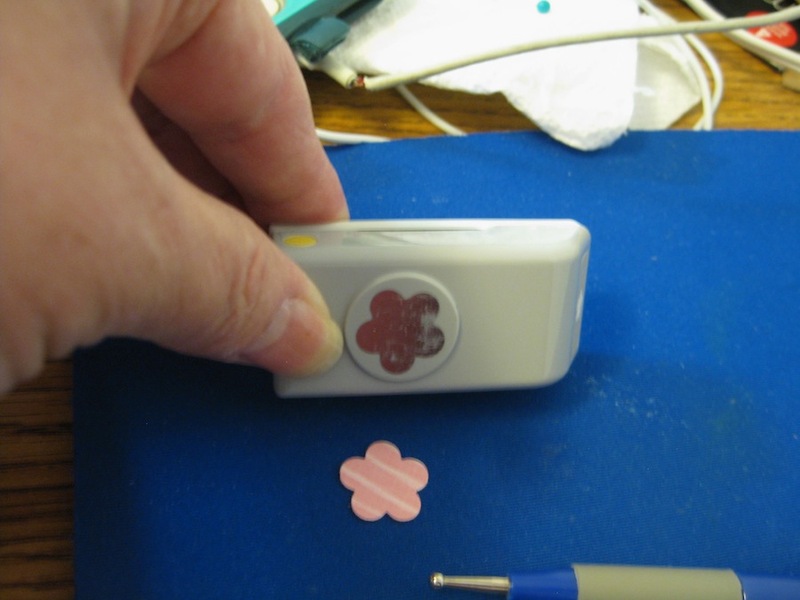 I’ve used the Word Window Punch on the rectangular tag and the Modern Label Punch on the fancy die in the set. I’m thinking of using rub-ons to give the tags their “names”. 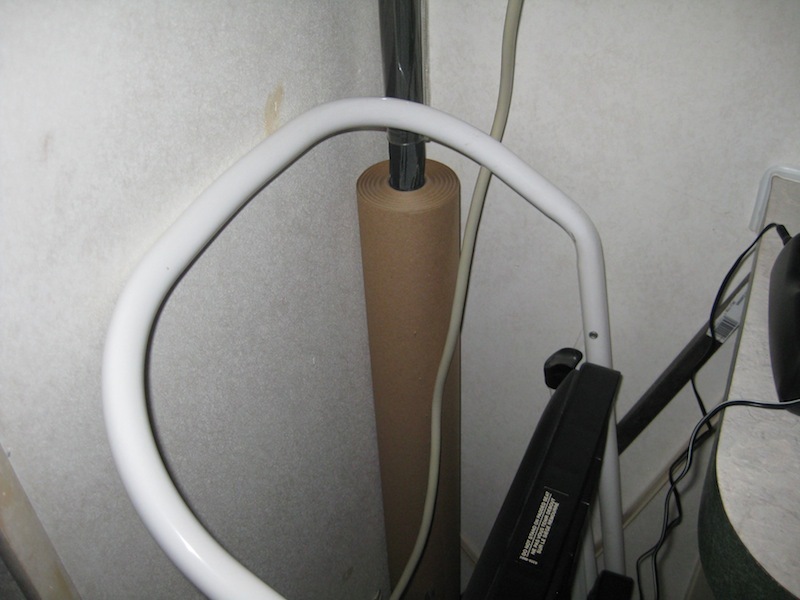 The papers are really old and discontinued SU paper that I’ve had in scraps. This die in the set has a perforation around the inside if you want to use it as a frame. 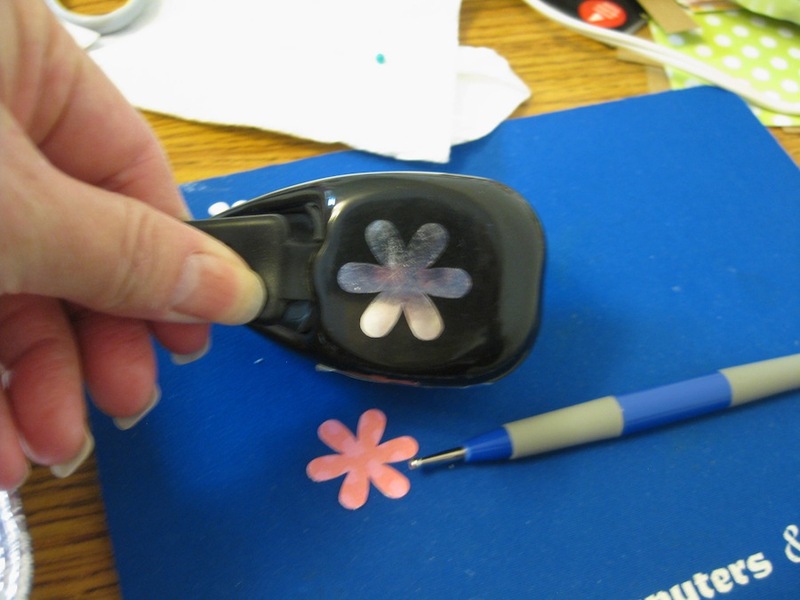 I’ve used the Extra Large Oval Punch (the old black style is known as the “Wide Oval”) on another scrap piece of discontinued paper. 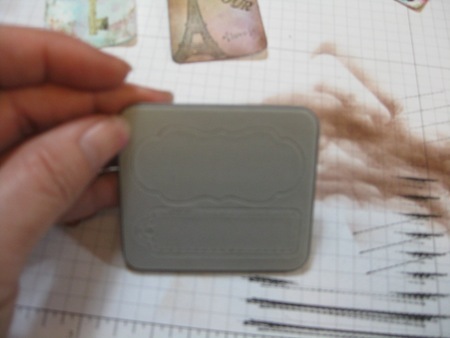 The die, itself, is cut from a piece of Chocolate Chip Textured Card Stock – another scrap piece I had. I have a mini I’m working on and it is in desperate need of some pops of interest. This is the third die in the set of four. I’ve used it on another piece of discontinued paper scrap. 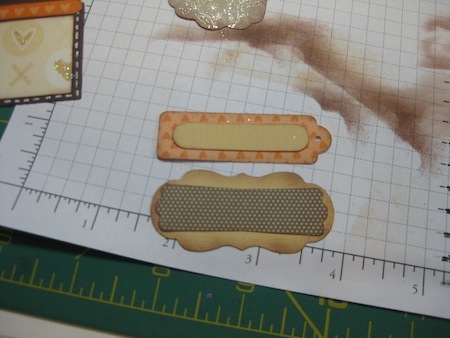 Using a glue pen (my stash) to the print and adding Dazzling Diamonds makes for a pretty spot of shine and texture. 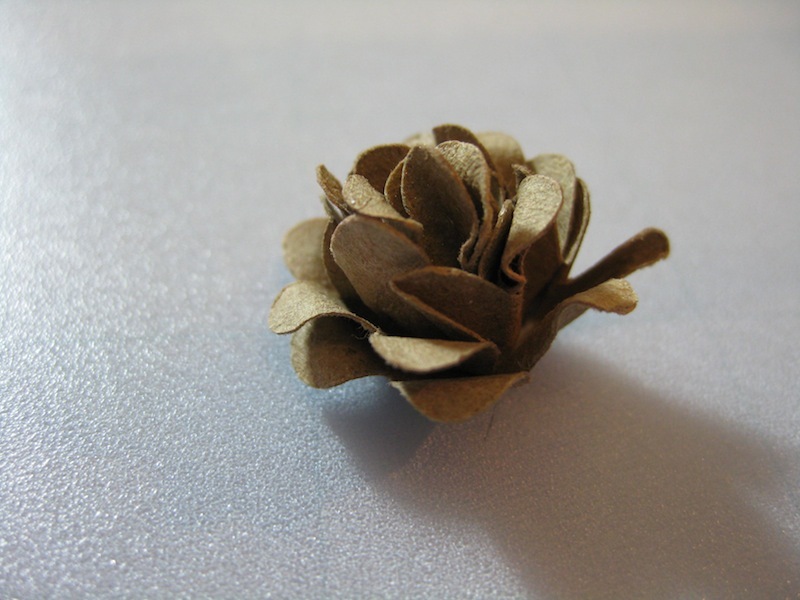 This little die cut would be really cute with a button or small flower attached. This die has a perforated top edge that can be folded over for a tiny pocket tag. Using the white Gel Pen #105021, faux stitching lines have been added around the outer area of the Chocolate Chip Textured Card Stock scrap piece then an inset of another piece of discontinued scrap paper punched out with the Large Square Punch. 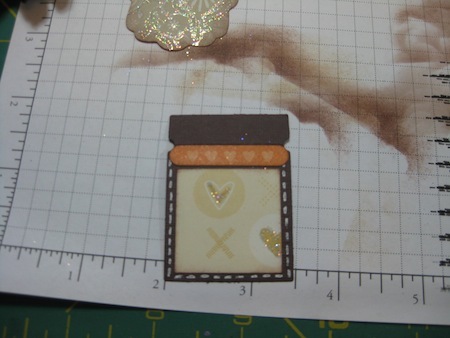 The orange bit at the top is a sticker from a discontinued scrapbook SU set. The three flower punch has been discontinued. 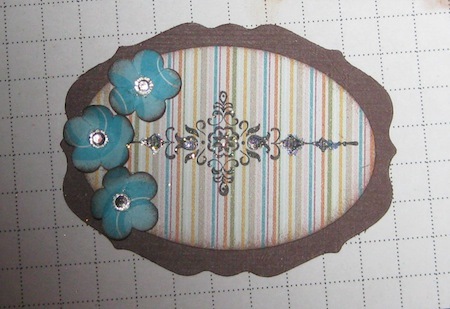 Using more scraps of discontinued paper for the three flowers and the Extra Large Oval punch, a stamped image from Artistic Etchings stamp set and some Basic Rhinestones #119246 make this die cut look really good. 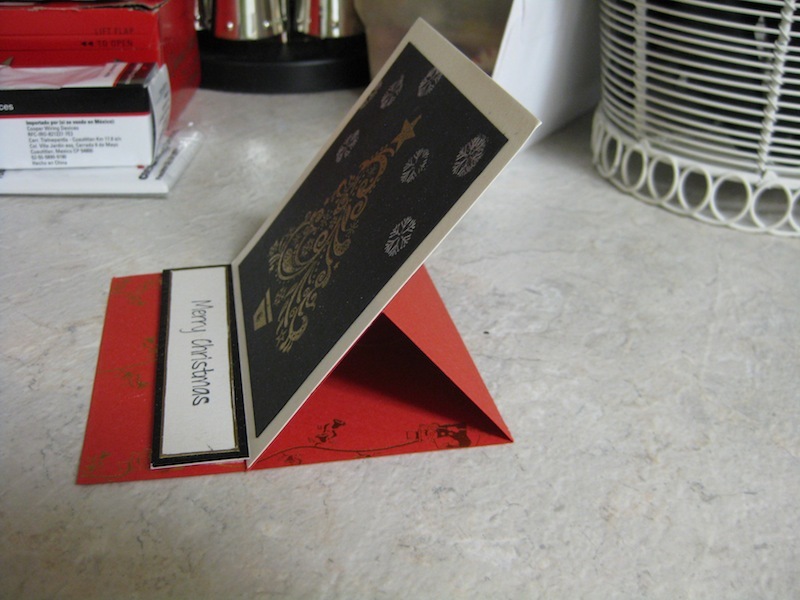 This one set of Sizzlit dies, along with your store of punches, can be a “multi-tasker” in your card making arsenal. 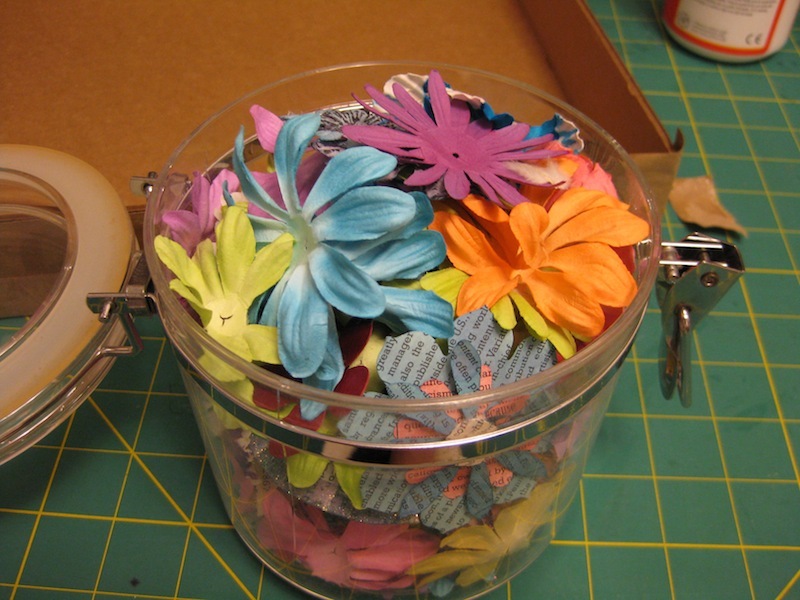 Use up your scraps of paper with these dies to create something fresh and new. 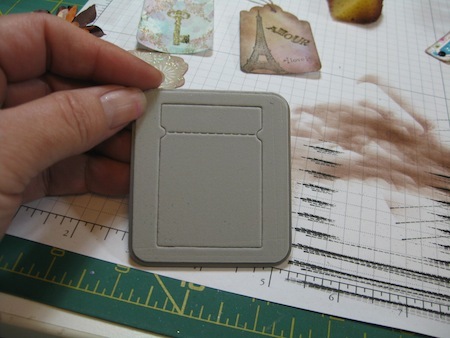 These die cuts are just the right size for mini albums also. 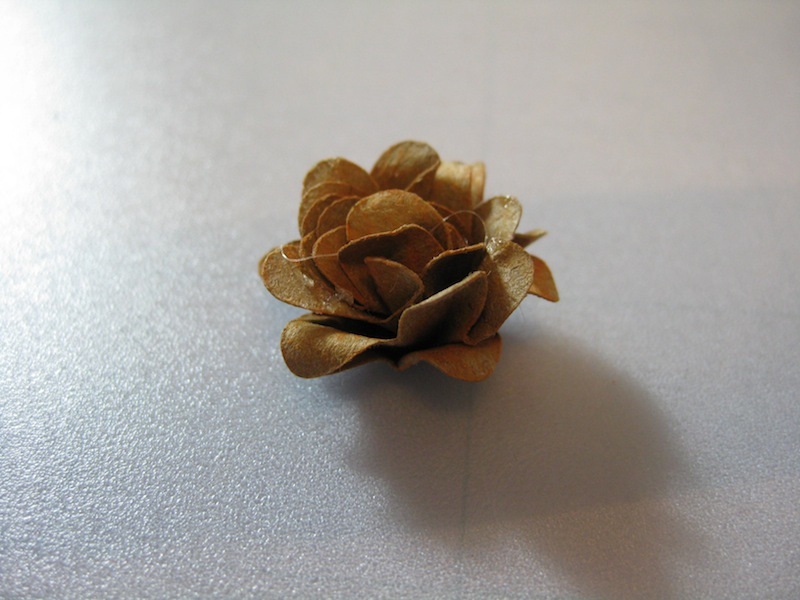 And last, but not least is a flower I’ve made. Yes. 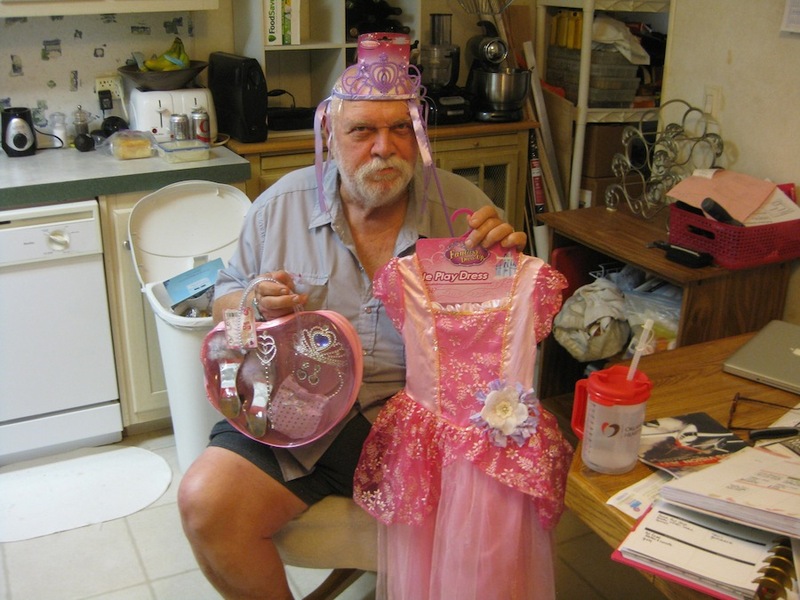 As you can see I did work on my “Glitter Phobia” and pressed on ahead to my “Flower Phobia”. 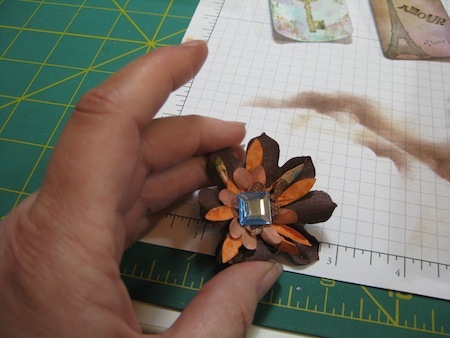 Using more of my scrap pieces of discontinued SU paper and a square gem from my stash this flower was created. Stealing a technique I’ve seen on YouTube. 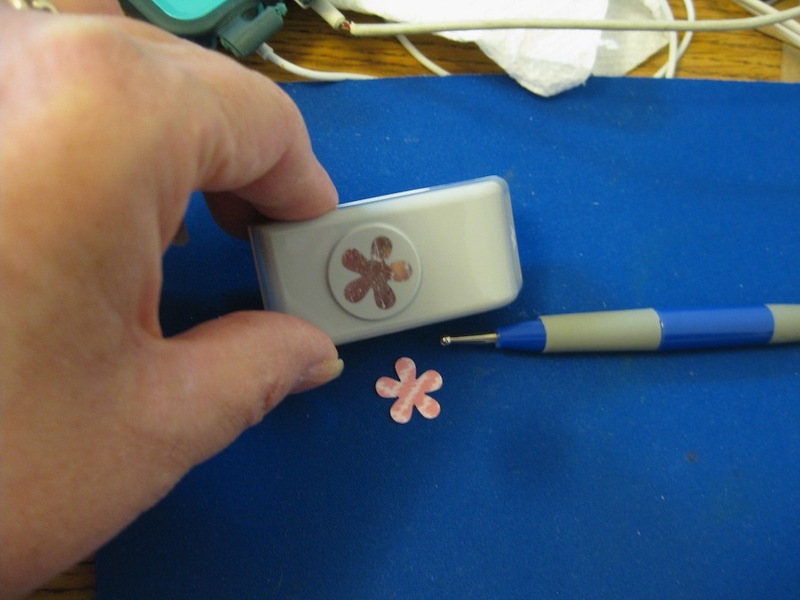 Wetting the pieces with my SU ink refill brews, squishing them and wadding them up then drying them with the heat tool and carefully opening each piece up and layering them together this flower was created. By the end of the day I felt pretty darn good with my “rouge experiments”.